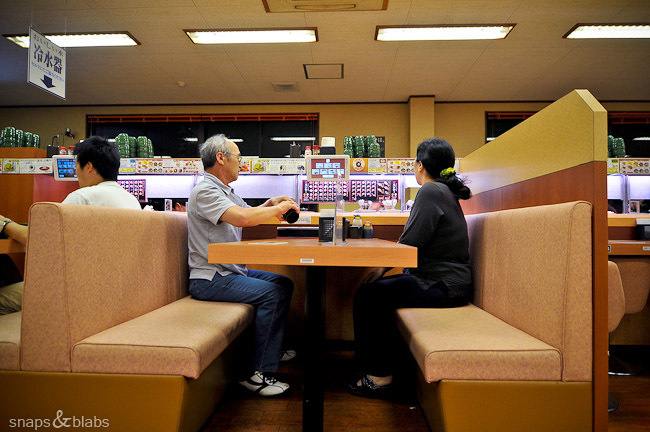 We have spent a lot of time in Japan’s cheap sushi restaurants. Some are better than others, but all quite a good value – 105Yen per plate ($1.20). Bellow are pictures for my One Minute project in the place we visited quite often while staying in Kyoto. The setup should be quite familiar to everyone that loves to go to sushi train all over the world. The difference in the Japanese ones from those in Australia has been the touch monitor ordering, which delivers beeping plates on the conveyor belt especially for you, as well as the thick soy sauce alternative along side the normal one. That, and the variety of sushi that rolls on by, which is quite impressive – for example pork, ham, eel, preserved eggplant, bonito, toasted salmon/tuna or with melted cheese and mayo. Today was a late start again. I have never seen a sushi train, it looks like a lot of fun, my girls will love it . and the price, wow!! we pay here (Israel) 10$ for 1 sushi roll. can’t wait to visit japan. i wanted to ask you, what is the websites that you use to find houses to stay in/rent? I search all sorts of places. I found the house in Kyoto on VRBO, but it is the first one that was a good price and that we used. I search the Internet for long-term vacation rentals, self-contained apartments, guesthouses and etc. Sometimes, when its proving harder, I look through expat forums for some ideas. I came across airbnb.com, there are many good deals you can find there. i wanted to tell you that I don’t think you are aware of the changes in life your blog can cause (in a good way) i will tell you about it one day. in the last weekend, we went on a trip to the north of Israel, it took us 3 hours to get there and 3 hours on our way back. we couldn’t wake up in the next morning and it took us 3 days just to get back in shape, so you are, traveling for 200 days, no wonder you are tiered and a bit nervous, why not settle down in one cheap country for a little longer even in the cost of missing one country you wanted to see?, just a thought. 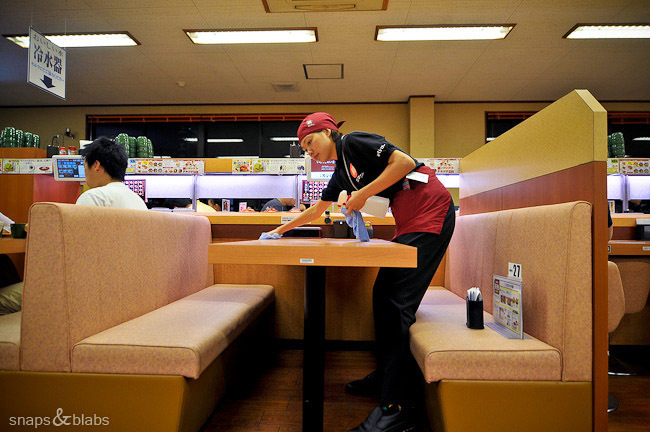 I’ve never been to Japan but would love to go…one day….but it never ceases to amaze me how mad they are about technology and automation like your Sushi restaurant example. 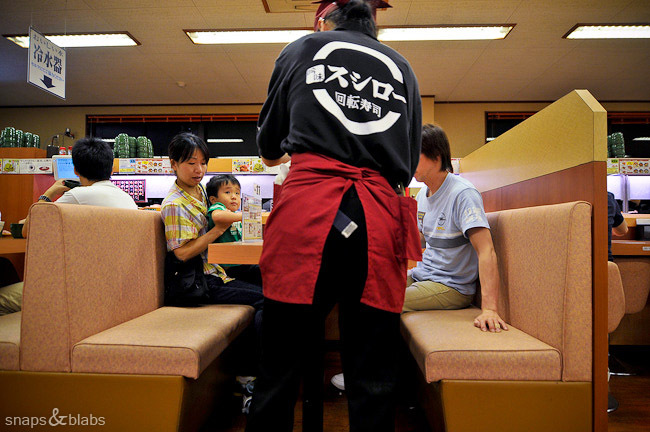 It would seem to be in contrast with the spirit or traditional culture of the Japanese but they seem to embrace it. Fascinating all the same and sushi trains are great fun, spent many a night in various countries eating just one more plate than my belly can really fit in. Rinat, do tell me how you get money out of your website. Even a little bit will be of help. Changes in life? I hope good and I hope you can tell me one day while we are enjoying a good meal somewhere. We will rest a bit in India, at least that is the plan and so far very little has gone as it says. But there is hope. Amber, even thought hey have embraces technology, they have also managed to keep it separated from their culture beautifully. It doesnt seem to interfere with the essence of what they are and what they value, which is rarely technology based. Hi, Jia. Sounds like a good base itinerary. 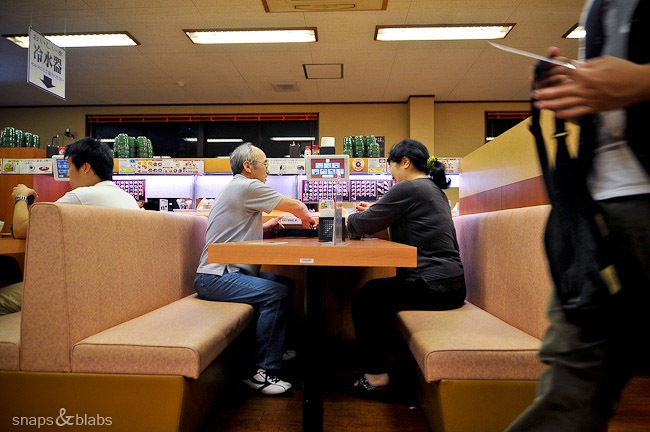 Unfortunately we did not spend enough time in Osaka to find a spot. We generally looked for the 100 Yen sushi train places (actually 105 with the tax) and were never disappointed). One cannot find sushi at that price anywhere else really. Have a great time in one of our favorite countries for travel.